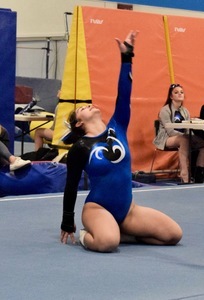 For Blue Wave gymnastics Senior Captains Nikki Carlo, Lily Fairleigh and Sofia Fea-Ruiz, their last home meet was a memorable one. The Wave had their best meet of the season against teams from Trumbull and Staples and individual competitors from St. Joseph and Norwalk high schools. Darien topped their previous highest team score by nearly four points, totaling 130.95, just .75 behind last year’s Class L runner-up Trumbull with 131.70 and ahead of Staples with 124.4. The other schools were not eligible for the team competition. 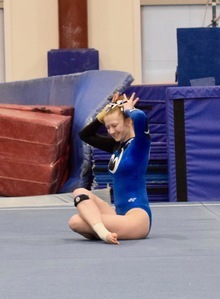 Darien outscored Trumbull on three out of four events, starting with the first rotation on vault where every Wave gymnast scored over 8.1 for a team total of 34.7, also a season high. Freshman Sommer Schmidt and Fea-Ruiz both scored 8.3 for their twisting vaults and sophomore Lauren Grandon made the most of her season debut on vault, earning 8.4. Junior Lana Schmidt matched Carlo for the highest vault score of the team competition with 9.0. 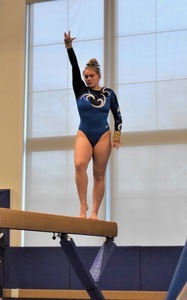 Though the Wave had a few bobbles on bars, they still improved their team score by two tenths. Freshman Maggie Russell hit her best routine so far to start the scoring, followed by sophomore Lucy Collins who earned 7.1. Lana Schmidt’s switch kip and layout dismount earned 7.5 and Fairleigh nailed her release and swung to her season high score with 7.7. Beam was a dream for the Wave, scoring 34.55 with no falls by any of the six competitors. Darien improved on their season high score by two points, and outscored Trumbull by 2.35 on the event. Fairleigh landed her leap combinations to add 8.4 to the team total followed by Collins who was rock solid on her back handspring for 8.5. Carlo was steady through her routine and cartwheel to full twist dismount for 8.65 and Lana Schmidt scored the team’s first 9.0 of the season on beam with her skill-packed routine.